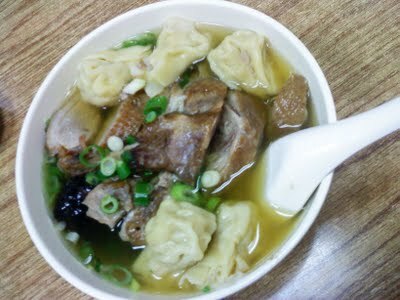 Whenever I’m craving a bowl of pipping hot and steaming goodness, I head to Bo Ky in Chinatown. Last night was one of those nights, after a couple days out of town, my tummy was demanding a big bowl of hot, soupy, homey, comforting, slurp till the last drop concoction that only my mama and Bo Ky could offer. Since chubby mama is on the other side of the world, Bo Ky was the next best thing. It’s a no frills… no frills at all, family owned, real old school chinese noodle restaurant. I’ve been going there for almost a decade and faces haven’t really changed, the place hasn’t changed much (they added air condition!!! I was so happy about that! ), the menu’s still the same, and most importantly the flavors have remained unaltered. 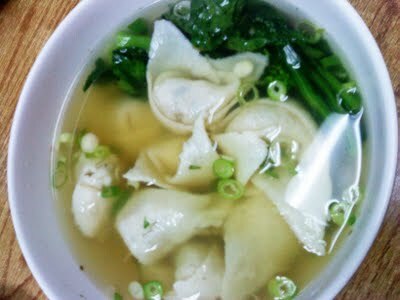 They offer a variety of toppings for their noodle soups, duck, chicken, seafood, fish cakes, fish dumplings and wontons, but also a good selection of rice dishes and appetizers like spring roll and fried tofu. Before your food arrives, scoop out some hot sauce, or in my case ALOT (essential to the meal experience). You’ll find 2 kinds of hot sauces on each table, go for the dark brown homemade hot sauce, it’s so good that they actually bottle and sell it by the counter! 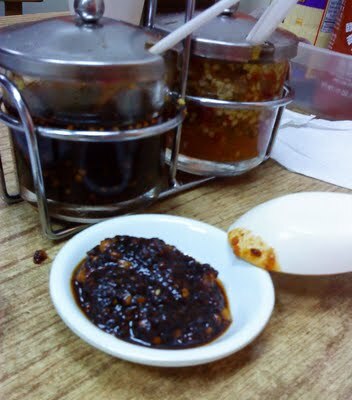 This secret recipe has the perfect mixture of chili, sesame, crushed peanuts and I’m guessing some kind of “sacha” sauce (garlic, shallots, dry fish plus shrimp and other spices). I’m telling you, this sauce pairs well with everything, i usually eat 2 large spoonfuls and I’m always tempted to bring some home, but then I remind myself how much more I would eat, and I can’t turn from Chubby to Fat Chinese Girl… I mean I do have the logo done! so, I’ve never bought it. My all time favorite is the Duck Noodle Soup with Ho Fun (broad rice noodles) you can add veggies and or wontons to your bowl. The soup base is made daily from duck, and it’s by no means gamey tasting, instead it’s a clear, savory and aromatic broth, perfect with the sprinkles of fresh chopped scallions. Ho Fun is soft and silky, and the duck is one of their specialties, Chao Zhou style country duck, it’s soaked in herbs and spices, hence the wonderful flavors, not your usual crispy roast duck. You can opt for soup on the side, and dry style noodles too, but I prefer it all together. I also order the Fish Dumplings over and over again, filled with a great mixture of pork, water chestnuts and dried mushrooms, no fish. The fish is actually in the wrap, which is the best part, it’s similar to eating fish cakes, with some ginger and white pepper in the mixture, but thinner, less salty, and a little more flour of some sort so it could hold/fold well with the filling. It has an interesting bounce to it, and a little chewyness, it’s made unlike any other place I’ve tried. Surely there’s a craft in making these and an old traditional recipe. Love it! Something more adventurous? 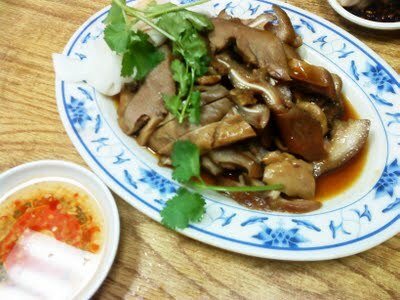 How about a plate of the Soy sauce braised innards, with pig ears, tongue, stomach and intestine. Well, I guess being asian, we are no strangers to this, and honestly to me, this isn’t crazy at all, I mean I love crunchy pig ears, and tongues are so lean and delish (we should eat more of it, specially since it’s all sliced, and you don’t see the shapes of things). This again, is great with the sauce. There’s also a great Braised Pig’s Feet which is also worth a try, it’s fatty, succulent and sticky, all signs of a good pig’s feet dish. 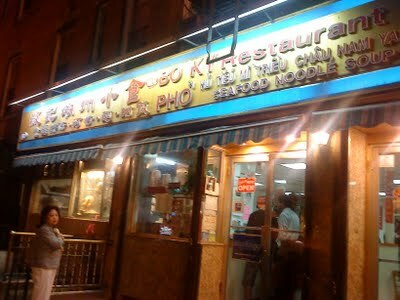 If you rarely venture out to Chinatown, don’t be afraid, this place is very friendly. The menu comes with pictures, and the old school waiters, to my surprise, actually speak some english. Don’t expect perfect service, just know that the food will be amazing and the price of a dish/bowl is roughly equal to a venti skinny latte. Now let the splurping begin! YUM! looks so good. I will try this on my next trip to NY! That Soy sauce braised innards looks good!! im so hungry right now! i arrived nyc today after my agent booked me via easyclick travel and im so excited! i'll eat everything!